Panasonic has expanded the CS, CT, and CX SP-Cap series to include higher voltage caps with range up to 35V. The newest additions to the SP-Cap product line features high voltage, low profile, high-temperature reflow, and unique electrode materials for high withstanding voltages. 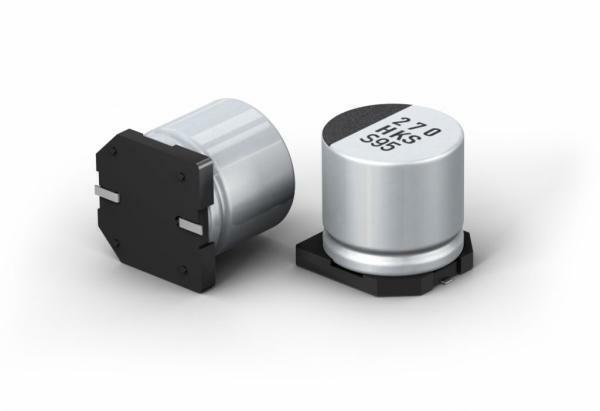 The higher voltage SP-Caps are used with DC/DC converters, output signal stabilization, and filtering. Panasonic’s SP-Cap Polymer Organic Aluminum Capacitor is a surface mount aluminum electrolytic capacitor that uses a conductive polymer as its electrolyte in layered aluminum construction. The SP-Cap product line from Panasonic consists of multiple series that offer capacitance range up to 560µF, voltage range from 2VDC to 35VDC, and the lowest ESR/impedance in the industry, achieving very good noise suppression and transient response. Unlike MLCCs, SP-Caps are free from temperature drift and DC/AC bias characteristics. In addition, voltage deration is not needed in SP-Caps, as in tantalum capacitors, due to their safety features. SP-Caps are the perfect solution for input and output capacitor for various DC/DC converters.